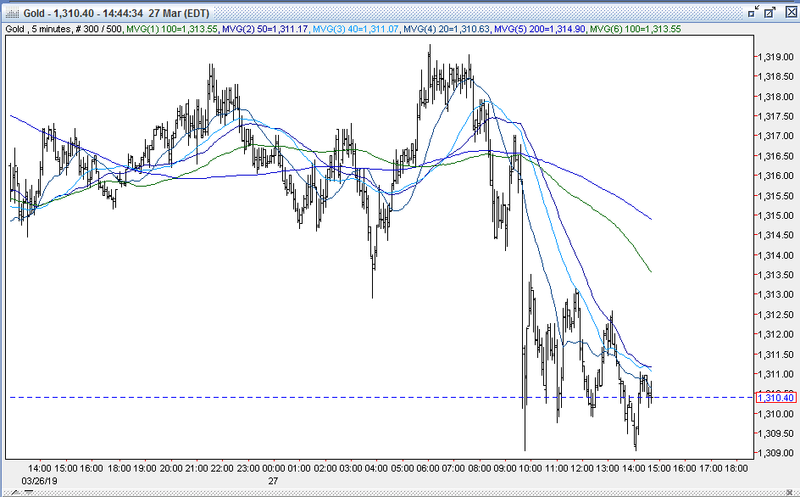 Gold traded either side of unchanged last night in a range of $1312.90 - $1319.30. After remaining fairly steady during Asian time, the yellow metal fell to its low of $1312.90 during early European hours, tripping some stops below $1314 (50% retracement of down move from 2/20 $1347 high to 3/7 $1281 low). Gold was pressured by an early surge in European shares and S&P futures (+8 to 2831), and a firmer US dollar (DX to 96.98). The dollar was lifted by a softer euro ($1.1277 - $1.1246) from some dovish comments from Draghi and the pound ($1.3215 - $1.3166) over uncertainty ahead of series of planned votes tonight on different Brexit options. 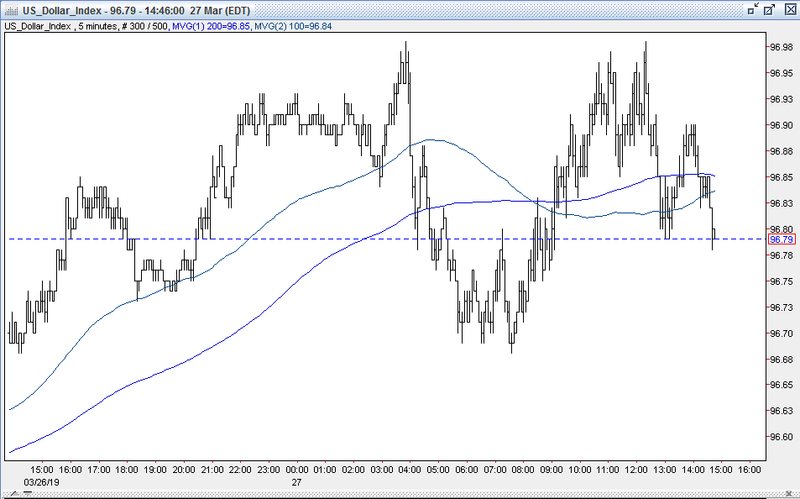 Later during European time, however, gold reversed and rallied to its 1319.30 high. It was boosted by a tumble in European shares and S&P futures (2814) and bond yields (German 10-year bund further negative to -0.062% - 29-month low, US 10-year to 2.36% - fresh 15 month low – Trump Fed nominee Moore calls for 50bp cut) along with a fall in the DX (96.68). The greenback was pressured from strength in the yen (110.71 – 110.23, safe haven buying), a rebound in the pound ($1.3230) from rising support for May’s Brexit deal, and the euro ($1.1285). At 8:30 AM, a better than expected reading on the US Trade Balance (-$51.5B vs. exp. -$57.5B) lifted S&P futures (2825) and the US 10-year yield to 2.402%. The DX rebounded to 96.87, and gold retreated to support at $1314. US stocks opened firmer (S&P +7 to 2825), and the 10-year yield – which had softened to 2.373% - firmed to 2.388%. 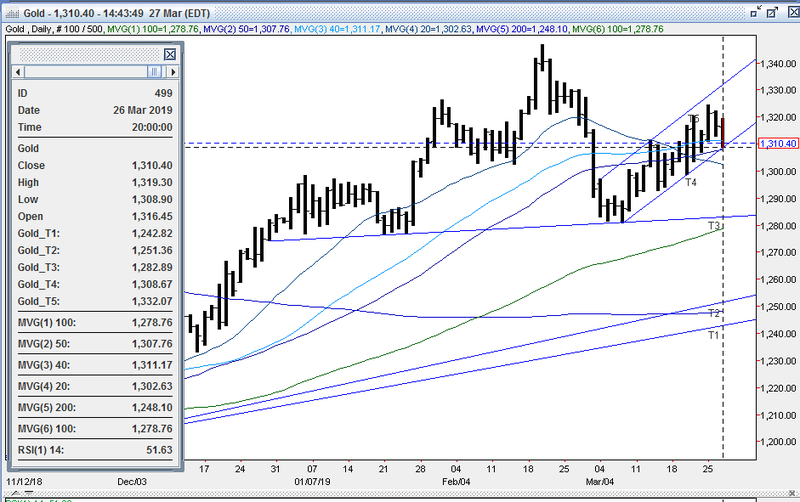 The DX continued to firm (96.91), and gold was knocked under support at $1314 to reach $1309 – finding support ahead of up trendline from 3/7 $1281 low. Equities turned down during the late morning hours (S&P -30 to 2787), hurt by a plunge in crude (WTI from $60.20 to $58.80) from a surprise build in US Oil Inventories (+2.8M bbl vs. draw of 2.5M bbl). Declines in the Health Care, IT, and Energy sectors weighed. The US 10-year bond yield slipped to 2.361%, holding just above its earlier low. The DX moved higher however, aided by a pullback in sterling ($1.3185) and the euro ($1.1242). Gold was caught in the cross currents, and traded in a choppy fashion between $1310 - $1313. Into the afternoon, US stocks trimmed losses (S&P -7 to 2810). The 10-year yield edged up to 2.385%, but the DX was tugged back to 96.79. PM May announcing she would step down as PM if her Brexit deal should go through lifted the pound ($1.3245), and the euro ($1.1266). Gold remained in the cross currents, and edged back to $1310. Open interest was off 15.3k contracts, showing a combination of long liquidation and some options related close outs from yesterday. Volume surged with 400k contracts trading, still inflated by the April-June contract rollover. Bulls were disappointed with today’s decline, given the dip in the US 10-year yield, and softness in stocks, and just a modest increase in the dollar. However, they’re encouraged that support at $1308 (up trendline from 3/7 $1281 low) and that the market is recovering nicely in its rising price channel from its 3/7 $1281 low. Bullsmaintain that gold’s correction down from $1347 has been overdone, and feel that it has consolidated ahead of key support at $1277-80 (7 bottoms – 12/28, 1/4, 1/21, 1/22, 1/23, 1/24 and 1/25 lows). Bulls feel that the trend is their friend and that the up move going back to the 8/16/18 $1160 low is still intact. They look for the strong rally over the past 7 months to carry further, expecting continued volatility in equity markets along with the surprisingly dovish Fed statement last Wednesday to keep downward pressure on US interest rates (note today’s 15-month low in the 10-year yield at 2.36%) and the dollar, which should help drive gold higher. Bulls also point to Friday’s Commitment of Traders Report (as of 3/19) that still has the large funds with a significant gross short position (116k contracts). Therefore, the bulls feel the gold market remains set up to move higher, as these shorts will provide fuel to further upside moves (especially as the market is approaching the mid-February highs) – when forced to cover. Bulls look for a breach of initial resistance at $1325 (options), followed by $1330 (up channel line from 3/4 $1297 high, double top – 2/27 and 2/26 highs), and then $1333 (double top 2/22 and 2/25 highs). Bears will take today’s pullback, but some bears are concerned with gold getting a lift from the recent decline in global bond yields – especially the US 10-year hitting a fresh 15-month low at 2.36%. However, bears maintain that gold’s recent bounce from $1281 is just a modest uptick within the early stages of a more significant downside correction. They still remain comfortable selling into strength and will continue to use rallies as entry points for getting short(er). They maintain that gold’s advance to $1347 had been overdone – having rallied $70 since the $1277 low on 1/24 (5.48%), $114 since the $1233 low on 12/14 (9.25%), and $151 since the $1196 low on 11/13 (12.63%). They feel that the 20% correction in equities – much of which occurred during very illiquid holiday trading – was also overdone, and expect the rebound seen over the past 12 weeks to resume. 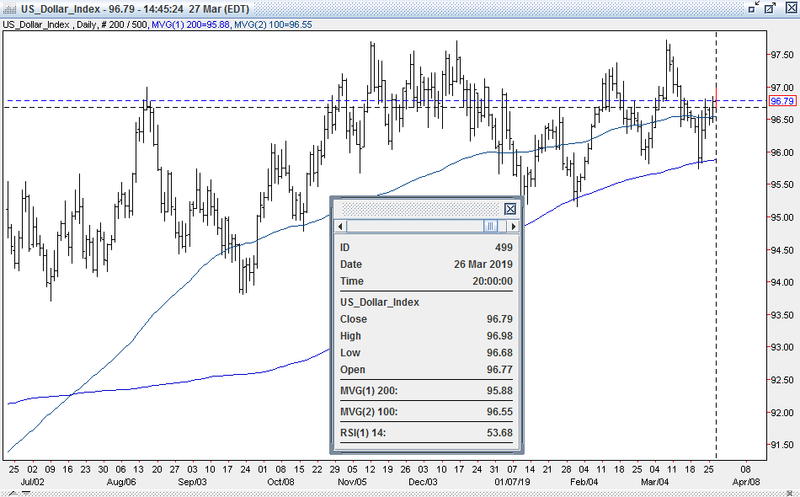 Bears also feel that the strength in the US dollar has legs – despite the surprise dovishness from the Fed last Wednesday - given the lousy Eurozone PMI data last Friday that forced the German 10-year bund yield back into the red. They feel that the US remains the sole global growth engine, and will continue to grow – despite the pronounced slowdown in global growth prospects. This, they feel, should keep the US dollar well bid (just shy of 97 today) and will continue to pressure gold lower. Bears expect further long liquidation to resume, and look for a breach of initial support at $1308 (up trendline from 3/7 $1281 low), followed by $1303-05 (former breakout of 6/15/18 top and prior 5 bottom support from 1/29, 2/7, 2/11, 2/13, and 2/14 lows), $1300-01 (up trendline from 3/7 $1281 low, options), $1298-99 (double bottom - 3/18 and 3/20 lows) and then $1291-94 (quadruple bottom - 3/11, 3/12, 3/14, and 3/15 lows). All markets will continue to focus on geopolitical events (especially Brexit news), developments with the Trump Administration (especially on US-China trade, potential legal issues), oil prices, Q4 corporate earnings, and will turn to tonight’s votes on Brexit and comments from the Fed’s George, reports tomorrow on Eurozone Economic Confidence, Industrial Confidence, Consumer Confidence, German CPI, US GDP, Personal Consumption, Core PCE, Jobless Claims, Pending Home Sales, Kansas City Fed’s Manufacturing Index, and comments tomorrow from the Fed’s Quarles, Clarida, and Bowman for near term guidance.